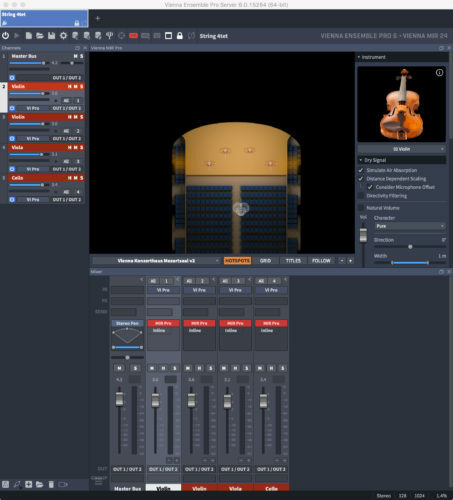 In addition to the world’s largest – and arguably highest quality – samples of Virtual Instruments (VIs) themselves, VSL software includes Vienna Ensemble Pro. Version 6 of Vienna Ensemble Pro (VEP 6) has just been released. We take a look to see what’s new and how well the product works as part of a highly-sophisticated audio and music studio environment. 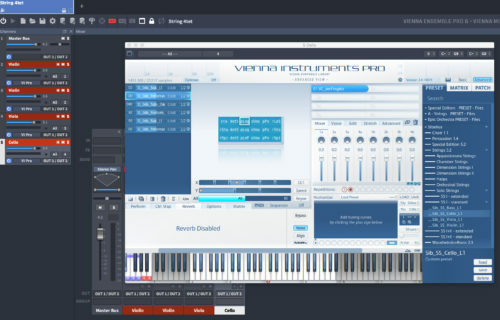 Vienna Ensemble Pro (VEP) is essentially an industry standard mixing and hosting solution, which allows one or more computers to network using Ethernet to manage multiple sources, samples/sample libraries, DAWs (Digital Audio Workstations), effects plug-ins and notation software etc. The name, Ensemble, is a good one: such software and the use of such samples are complex enough in themselves. So to build an environment which reflects, enables, and even enhances workflows sponsoring sound synthesis, manipulation, sequencing, sample management, notation and composition, the addition of realistic reverberation and acoustic plug-ins is a huge advantage. To control all of these resources well – as can be done with Vienna Ensemble Pro 6 (VEP 6) – is a significant achievement. And the quality of sound remains superb. It allows you easily to link and control those other components all in one place. The benefits of reduced latency and reliability (never do you have to restart such applications) are significant. If you’re fortunate enough to be able to dedicate a separate machine altogether to this purpose, such benefits will be even greater… for this review only one (admittedly fast all SSD) iMac was used. VSL has always put a lot of thought into distributing power. These products easily handle the demands of most cadres of musicians from large professional studios to the lone amateur. Cross platform, VEP 6 even allows virtual instruments, 64-bit and 32-bit VST/AU and effects plugins from developers other than VSL to be integrated and – with its proprietary ‘Preserve’ function – to remain loaded when switching between projects. You can disconnect VEP 6 from your sequencer yet keep all your instruments and samples loaded. Conversely, it’s possible to purge all (unwanted) samples and instantiated Vienna Instruments from RAM using the single “Optimize All” button. VEP 6 seamlessly integrates Vienna Instruments, which comes packaged with it or Vienna Instruments Pro if you have the VI Pro license. A rich array of third party AU and VST (for the first time on Mac) plug-ins and VST3/AAX Native/RTAS/MAS connector plug-ins is supported; as are up to 48 MIDI ports and 768 audio ports per instance. For this review the MIR Pro convolution reverb extension as well as Avid’s Sibelius 8 notation software were used to evaluate the performance of VEP 6 in real music-making contexts. The VEP 6 package comes with VSL’s Epic Orchestra sample pack. At first site, the interface of VEP 6 may seem overwhelming; it resembles an aircraft’s cockpit. In the center are the detachable/re-snappable components (Vienna Instruments, MIR etc). To the left are the instruments’ channels. Along the top the Instances (of connections to sources). Immediately underneath, the task-bar with the dozen and a half clear icons (which – like most other controls in VEP 6 – have tooltips) for general controls of the software. Along the bottom are the Mixer controls. This is a logical and straightforward “division of labor” which truly facilitates quick access to elements of your workflow because so sensibly grouped. Significant and significantly-improved in VEP 6 is the extent to which many of these sets of controls can be shrunk, moved, re-arranged, frozen and otherwise set up and preserved exactly as you want for ease and convenience. The result is that you can prioritize creativity and concentrate on the often iterative process of making music, not constantly having to fight with the software. The manual and video tutorials to which users of VEP 6 have access contain clear and comprehensive explanations of these components, their functions and uses both individually and – of course – when combined and integrated into the kind of productive creative workflow which the software goes so far to encourage. One of the strengths of VEP 6 is the way in which it meets the user more than half way. The software is intended as an all-embracing template to configure, control and retain, say, multiple settings for multiple articulations for multiple instruments in sophisticated orchestral work. Yes, it is necessary to spend a fair amount of time setting up instances and channels for input, output, mixing and testing (the MIDI Bus) etc. But once you’re happy with (combinations of) settings everything is saved for good as a VEP Project, typically in Users/Shared/VSL Custom Data and is automatically loaded when VEP 6 is next invoked. Such turnkey settings are typically saved with DAW or notation software projects and/or files so that – provided you have remembered to launch VEP 6 first – they are all available, no matter how complex, as soon as you resume work on a score or sequence of music etc. When visiting the VSL site to download VEP, you’ll notice significant improvements and simplifications in the site’s navigation and architecture. Having activated your license (note that there is a 30-day trial version of VEP 6) using the Vienna Key and eLicenser “dongle” system (which worked without hitch at all times, although an additional layer of potential complexity), you’ll choose between four versions of Vienna Ensemble: 32 and 64-bit, for standalone and server… the latter was used during the current evaluation. In reality all three of these improvements inVEP 6 work together to make this product a worthwhile upgrade. But let’s look at how each of them performed under testing and evaluation in order to reach conclusions. Key areas of code have been rewritten to make the software much faster: there is a decrease of about 70% in CPU usage for internal calculations and 80% for graphical operations. This was evident in a corresponding speed increase during testing. Improvements in multithreading where plug-in hosting is concerned have also contributed to snappier operation. VSL assumes that it will be important for many users to be able to switch more quickly and reliably between projects. To this end faster connection and disconnection has been achieved in VEP 6. Similarly, channels that are intentionally disabled or frozen can now keep their data in tact while freeing up memory allocated to (other) plug-ins. Indeed, plug-in scanning has also been made faster. The auto-save functionality has been streamlined to occur only when sound transport is stopped… playing is not interrupted. Lastly, when using the MIR reverb extension, its Impulse files load a claimed five times faster. Although hard to quantify during evaluation, operation of Vienna Ensemble Pro 6 was certainly much quicker than that of version 5. Such a piece of software as Vienna Ensemble Pro 6 needs to help and support the user, needs to make achieving the potentially complex as easy as possible. Perhaps most importantly, it needs to “think” as a composer or musician thinks, not as a programmer. While version 5 of Vienna Ensemble went a long way in that direction, this latest iteration really anticipates likely workflows of the busy or inspired creator more successfully still. Now, for example, you can group channels in such a way that they can all inherit a single parameter. You can opt to “raise” the instance of a plug-in so that it is automatically available. In practice this also tightens the relationship(s) between plug-in and controller. VEP has always had the feel of a dedicated “console”, into and inside which elements are placed and maneuvered. Issues of resizing and detaching/attaching those windows, re-arranging them and making them generally easier to manage has perhaps never been implemented perfectly because of the complexity and number of controls/parameters in (each of) these windows. Now, version 6 has all but solved the conundrum. All plug-in and Audio/Event Input Plug-in windows are resizable and can be unsnapped and (re)docked to suit your current operation. The metaphor of Channels has also been rethought. This is a major improvement. Each VEP 6 Channel can now be… what you want it to be: a bus, an audio input, a plug-in channel, a channel representing Vienna Instruments (Pro) or for Vienna Imperial. And all via drag and drop. After you’ve got used to the enhanced functionality of VEP 6, it’s the much improved graphics, the actual user interface, that is likely to strike you. VSL’s products (and indeed their website) have always had a somewhat technically heavy look and feel. Almost like the caricature of a physical studio with multiple banks of apparently identical sliders and switches. Although these have not made software like Vienna Ensemble difficult to use, there are times when the font is smaller than ideal – in ways similar to some of Apple’s Professional products like Aperture. This is mitigated somewhat by the fact that VEP 6 now supports Retina (HiDPI) graphics fully. The choice of colors, fonts and background contrast in VEP 6 is improved. It’s clear that the designers of VEP 6 put a lot of thought into this upgrade. Without risking making such large changes as might disorientate the user, they have really made things much easier to control. For example, Instances can be tabbed in such a way that you can organize, color-code, detach and rearrange them to suite your work. Another result of this, of course, is that all your Instances can be controlled in one single window. They’re also detachable and can snap back inside the “console” (see above) when you want them to. As well as a better system to collapse Channel strips (although the colors of the text at their side remain a little hard to read… dark blue on blue), Channels themselves can be grouped in meaningfully-labelled and color-coded hierarchies of sub-folders. You might want to use this arrangement for different orchestral instrument families, for instance; or according to source, or how you have arranged reverberation in MIR etc. reverb. Similarly, you can better customize the Mixer interface so as to hide the sections which you don’t need at any one time. Even at its simplest, VEP 6 remains a complex piece of software – not least because the concepts at the very heart of it are specific to the world of digital audio and the relationships between hardware and networking on the one hand; and software and the conventions of sound processing (MIDI, Channels, AU, VST etc) on the other. Add to this the fact that VEP 6 successfully facilitates the advanced and sophisticated interplay of all of these by sponsoring the flexible use of “instances” of setups and configurations and it needs a clear head and plenty of stamina to make the best use of the control which this product offers. Although perhaps not perfect in setting the scene (a glossary and coverage of some basic terminology and concepts would have been useful), the 120-page PDF manual and user guide is as comprehensive as most users will ever need. Written for both Mac and Windows users (the differences are actually minimal), it’s clearly illustrated and – a few errors (edits referring to VEP 5, for example) aside – does the product proud. Conclusion: Not for nothing does VSL point out that its products (the samples are state of the art) are used widely in studios worldwide. Only 16 years old, the company has sold literally millions of samples and products despite working in a decidedly niche market. Research-driven, the team at VSL aims to bring authenticity with the maximum ease of use. Vienna Ensemble Pro 6 is typical of this approach. Retaining what worked well in earlier versions (particularly 5), VEP 6 has introduced much that takes things still further and is an essential upgrade to anyone using other VSL products and/or who wants to make the most of almost any (major) component in the world of audio and music. (Digital) technology could – and often does – obscure the process of serious high quality music making by failing to tame the complexity of the former and making the latter subservient to it regardless. Not so VEP 6. True, it is likely to take many users some time even to become familiar with what the software can do; let alone how to marry all its components in ways which genuinely foster focused music-making. But once you’ve got used to the metaphors employed so intelligently by VEP 6, it’ll all become second nature. The allocation and location of Preferences, for instance, seem to become relevant and needed at just the right times. Navigation throughout the interface becomes natural and you quickly learn the ways to achieve different tasks… the fact that MIDI Channels can be allocated in more than one place, for example. There is no more sophisticated, yet ultimately easier way, to organize your digital music resources. Vienna Ensemble Pro 6 is wholeheartedly recommended.